The Planar iS40 integrated digital sign is comprised of an ultra bright 700 nit, 40-inch LCD display with all the integrated software and electronics necessary to deploy a digital sign out of the box.As InfoComm, where the world of commercial AV is on display (pun intended), is upon us, let's take a look at the advances and trends that are big, bold, and that break the barriers of current LCD flat panel designs. With the gauntlet of "hot products" being introduced, the world of LCD flat panel displays has come a long way. Numerous manufacturers make extremely good displays, but here are a few notable advancements that should catch your eye during the show. LG Electronics has up until this point mainly specialized in the hospitality segment of digital signage, but now the company is expanding its vision into retail and entertainment venues with its "stretch screens". According to LG, these slim-line designs are built for space-conscious retailers; the M3800S and M2900S are roughly half the height of a traditional HD display. LG is also getting into the realm of interactivity with its own touchscreens. The 32-inch class M3201T and the 42-inch class M4210T are offered as a means to "engage customers' tactile senses". Stay tuned for more on interactivity as several major display manufacturers will be offering their own versions of touch technologies in the very near term. Planar has specialized in the commercial display market, making some very robust displays for various levels of complexity within applications. The "heat" in the Planar camp comes from both light output and its ownership of one of the best digital signage software companies out there, CoolSign. Combining software and hardware in a single package-now there is a novel approach. The Planar iS40 integrated digital sign is comprised of an ultra bright 700 nit, 40-inch LCD display with all the integrated software and electronics necessary to deploy a digital sign out of the box as a fully managed node within a CoolSign network of tens, hundreds, or even thousands of digital signs. On the large image side of things, Planar also offers its m70L, which produces 600 nits/cd/m2 of light output. Do not forget that a typical 40-inch LCD gives us 400 to 450 nits/cd/m2, so this qualifies as truly hot. As we turn our attention to Sony, we see more and more homage being paid to the burgeoning digital signage market. My favorite new toy from Sony is anything but a toy. The 52-inch GXD-L52H1 features a durable aluminum frame that surrounds a tempered glass front panel, but that is not all. The front panel is exchangeable! They call it the Exchangeable Protection Panel, and it can be conveniently replaced with a new one, if required, without having to dismount the whole display unit. Sony also offers a unique backlighting system that provides continuous light, even in the unlikely event that the original backlight blows out. For those with a multitude of input requirements, Sony includes a slot design for input modules not unlike what we have seen in certain plasma displays. Sony even has its own full HD digital signage player, the VSP-NS7, which can be easily attached to the rear panel of the GXD-L52H1 to form a space-saving and simple digital signage system. As we have been preaching and teaching all year, it is all about digital signage in one form or another. Not surprisingly, one of the really big stories comes from Samsung. Having just seen its product roadmap, it is hard to know where to start, but to say Samsung is taking the digital signage market seriously would be an understatement. Let's begin with brightness. I was aware that the new DX series products pioneered the ultra-bright LCD panel revolution with displays producing from 600 to 700 nits/cd/m2, while competing products produced 400 to 450 nits/cd/m2. Not so fast, say my insiders. How about 1,200 to maybe 1,500m nits/cd/m2? When one considers how LCD panels are made, and the limitation in light transmittance and heat buildup, this is huge. Samsung also informs me that it will have displays with 11mm bezels coming out after having just introduced its 22mm bezels. This is about as close to no bezel as you can get while still maintaining the stability of the panel in the frame. With all this technology being thrown at us from Samsung, I would be remiss not to mention MagicInfo. This is Samsung's next generation of digital signage software that is built into the Samsung DXn series of displays. The DXn series has an embedded dual core processor and several gigs of flash type memory that eliminates the need for a separate player or computer in the system. Sharp has been quietly producing great LCD panels and displays from the very beginning, but lately has been into making a splash. I cannot think of a bigger splash than its new 108-inch LCD. A friend inside the company who understands display calibration at the highest levels has shared that the panel is very good. He acted excited but almost surprised; I am excited but not surprised at all. Lest it be known for size alone (although size does matter! ), my other favorite Sharp LCD display is what's being called a "special edition" for the consumer electronics market, the Aquos LC-65SE94U. It qualifies as "hot" because of incredible picture performance. This 1920x1080 panel is Sharp's next generation 10-bit ASV LCD panel from the Kameyama factory. Sharp claims it produces 27,000:1 dynamic contrast ratio and features a 4ms design. This product includes a built-in tuner and a unique feature called Aquos Net, which delivers customized internet content and live customer support via ethernet, viewable in full screen, split screen, or sidebar formats. Vidikron continues to expand its high-resolution flat panel display offerings with the new DView VL-57 LCD display, Vidikron's largest LCD monitor ever. The new VL-57 is a full 1080p model and provides performance and a comprehensive feature set in a large 57-inch diagonal screen size. Vidikron's internal video processing offers imagery, scaling, and reproduction of both native film and native video formats. The models also include the complete Imaging Science Foundation calibration suite to deliver the best image possible under multiple viewing conditions. NEC Display Solutions' MultiSync LCD6520, a 65-inch large-screen LCD display available in portrait or landscape orientation, is ideal for digital signage applications, including transportation and corporate boardrooms. This model boasts the Digital Signage Technology Suite, nearly 30 features that enhance display management, improve screen performance and lower total cost of ownership. The built-in expansion slot allows for seamless integration of future third-party components, and its exclusive panel design leads to less image persistence and a longer display life. This display offers a high-definition resolution and an optional digital tuner making it optimal for digital signage applications. Sony's KLHW32 supports ICS-SP30, a fully integrated HD video card for key hotel VOD providers. One slot can accommodate different sized option boards for video input, RS-232C/Control S communication, and optional BKM boards. A special setup menu allows access to unique features for hotels and is hidden from guests. With clone setup capability, the user saves time since all hotel TVs need the same configuration. The dark silver body color is unique to the KLH model and will fit any decor. Built in speaker and removable table-top stand eliminate the need for add on items. LG's 47LG60 displays HDTV programs in full 1920x1080p resolution for a more detailed picture. A 120Hz panel provides clear, smooth images, even during fast action scenes, creating a stable structure for a crisper picture. Unlike other sensors that can only sense brightness of ambient light, LG's Intelligent Sensor uses 4,096 sensing steps to evaluate its surroundings. The LG processes picture quality elements including brightness, contrast, color, sharpness and white balance. The result is a picture optimized for its surroundings, more pleasing to watch, and which can also save up to 50 percent in power consumption. Samsung reinvented its bezel and gave it a new look its Touch of Color feature. New Infolink RSS Access lets you customize updates on the TV. Receive instant stock quotes, weather and news information while watching TV. And Auto Motion Plus 120Hz delivers smooth motion action scenes and virtually no motion blur. Satisfy a craving for the latest in HD technology with the LN52A650 LCD TV. Sharp expands its professional LCD monitor line-up with the new TL professional LCD monitors series, offering full 1920x1080 HD resolution for use in a wide range of settings including teleconferencing, CAD/simulation, digital signage, corporate, educational, training, hospitality, sports arenas, entertainment, and houses of worship. This series, including the 52-inch class TL-M5200 and 46-inch class TL-M4600, joins the high-end PN Monitor series, providing an affordable complement for display and presentation opportunities requiring accurate and precise image reproduction. High image quality and color accuracy is ensured through the combination of Sharp super view LCD components and signal processing technology. One of Runco's largest LCD displays to date, the CX-52HD produces spectacular high-definition images in the highest resolution available, 1920x1080. It offers performance and a generous feature set, including Runco's exclusive Vivix processing for outstanding imagery, artifact-free scaling and pristine reproduction of both native film and video formats. The CX-52HD also includes the complete ISF calibration suite to deliver the best image possible under multiple viewing conditions. It features the brand's stylish industrial design with high quality anodized aluminum frames. 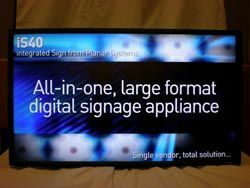 The Planar iS40 integrated digital sign is comprised of an ultra bright 700 nit, 40-inch LCD display with all the integrated software and electronics necessary to deploy a digital sign out of the box. The 26-inch Planar PX2611W widescreen flat-panel LCD monitor featuring WUXGA resolution offers sharp, color-rich images at any angle. With 82 percent more screen space than a standard 4:3 19-inch display, it can transform the workstation into a purely digital experience and increase productivity and performance. The PX2611W is for running high-end graphics and capable of simultaneously displaying multiple windows, webpages, or documents to minimize the time spent switching between windows and programs. The display offers Planar's RapidVideo accelerator and 5ms gray-to-gray response rate for superior video performance.